Rambam insists that this was just a dream (Guide for the Perplexed 2:41), but there is no particular indication of this in the text; we would do well not to impose our views on G-d and so limit His freedom of action - however it happened, Ya'akov knew that G-d had spoken to him and so acted accordingly. Rashi, for example, comments "Since you delayed your vow on the road," while Gunther Plaut adds, "Ya'akov's journey to Beth El brings the story of his exile to a close." Pointing to , the short name for G-d used at the end of the text, Nahum Sarna explains, "the short name is purposefully used here because it invokes Bethel. Ya'akov is reminded that he has not yet fulfilled the vow made at Bethel." Ya'akov is also given instructions on what to do once he arrives at Bethel: "dwell there" and "build an altar to G-d". Bethel is something of a climb, approximately 1,000 feet further above sea level, and - as the following verses in the story indicate - something of a pilgrimage. Ya'akov simply has to go. On the other hand, as the chapters unfold, we also know that Ya'akov doesn't stay at Bethel but makes his way on south, where his beloved Rachel will die. Although, as Sarna points out, "he need no longer flee, as the last time he was there; he is free to stay, without fear, as long as he wishes," Ya'akov nevertheless moves on, so what is the point of HaShem's instruction to dwell there? Sforno, too, agrees: "to attune your mind spiritually before you build the altar, as our Sages tell us, 'the pious men of old used to wait an hour before praying in order to concentrate their thoughts upon their Father in Heaven' (b. Berachot 30b)." Now there's a thought - imagine coming to services an hour before they start in order to settle one's mind on praying and focusing on G-d. What intensity and devotion we might see in our worship and prayer if the whole congregation did even half that! The next command also starts with an imperative verb , from the root , to do or make, "make there an altar to G-d". Twenty years ago, after seeing the vision of angels going up and down on a ladder between heaven and earth, and receiving G-d's promises, Ya'akov had set up the stone he used for sleeping as a memorial and poured oil upon it. Now, Hirsch comments, "He had erected an altar there to commemorate what he had received there from G-d, but had vowed to use the independence he hoped to get from G-d to change that memorial stone to a 'house of G-d'." Upon his return to Bethel, the Sforno explains that he is, "to give thanks (to G-d) for having fulfilled the promise made there. This is akin to the Sages' statement: He makes the blessing: 'Blessed is He who wrought a miracle for me in this place'" (b. Berachot 54a). Making the altar - and offering the appropriate sacrifices upon it - brings Ya'akov full-circle and completes the adventure he started with his father Yitz'khak sent him away to Padan Aram to find a wife in the house of his mother's brother. The vow he made is fulfilled; formalising the memorial stone in an altar makes the area into a house of G-d.
Based on this text, we can ask ourselves three important questions for our lives today: are we living too close to the Canaanite? Do we pause and take stock when coming into G-d's presence? Where are the altars in our lives? Some would argue that it is impossible to live too close to our neighbours, because that is an essential component of the gospel: being there and being on hand to laugh and cry, to live and die, to share and spend our lives as a witness to the kingdom of G-d. I'm not sure that this is actually the issue here. The Canaanite is being used as a short-hand for the seven nations then living in the Land of Israel, among whom the patriarchs sojourned; their (corporate rather than individual) wickedness was not yet ripe for the Children of Israel to purge the Land at G-d's command from the contaminations of idolatry and sexual immorality. It was the latter that caused the incident with Dinah as Shechem the son of Hamor took advantage of her. Dinah had gone out to visit the girls of the Land and got grabbed; she got too close. Every believer has a responsibility to keep their distance from known wickedness and ensure that they do not place themselves in the way of temptation or being taken captive. Nobody likes the over-pious people who won't join in and turn up their noses at every little whiff of the world; but we do need to have red-lines that we will not cross and which everyone around us knows that we will not cross, and that means there will be situations, conversations, films, humour, from which we simply must remove ourselves. 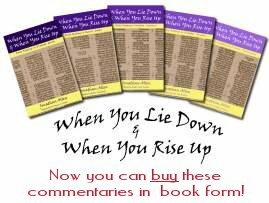 The Jewish tradition has an important saying, originating from pages of the Talmud (b. Berachot 28b): , Know before Whom you are standing. It is an important reminder that we come into the presence of the Creator of the Universe, not G-d Allmatey. Many of the liturgical churches have a prayer of confession that comes early in each service, providing an opportunity for the congregation to confess their sins together as a community. However, this prayer is not always used and, in any case, it doesn't obviate the need for each of us as individuals to prepare seriously for prayer and worship. Does that mean that we can never pray without spending time confessing sin? Yes and no; we should never miss out on getting our hearts right with G-d before we talk to Him, praise Him, speak on His behalf or tell others about Him, any more than we would with our spouse or siblings. But of course, in emergencies or critical moments, He understands and waives the formalities: it is more important to talk, even if there is a small elephant in the room. We should cultivate the habit of turning up early for services, rather than rushing in at the last moment or beyond, and spend those minutes praying quietly, for the service, for the leader, for ourselves, for open channels and ears and good communication and, most importantly, in getting any wrong attitudes and behaviours off our slate and brought to the cross for His forgiveness. Lastly, we need to pay careful attention to these words of Moshe: "You shall seek the place that the L-RD your G-d will choose out of all your tribes to put His name and make His habitation there. There you shall go, and there you shall bring your burnt offerings and your sacrifices, your tithes and the contribution that you present, your vow offerings, your freewill offerings, and the firstborn of your herd and of your flock" (D'varim 12:5-6, ESV). As believers in Messiah Yeshua, this is not about rushing off to Jerusalem. Yeshua Himself told the woman at the well, "The hour is coming when neither on this mountain nor in Jerusalem will you worship the Father" (John 4:21, ESV). One of the names that the Rabbis gave G-d is , The Place. He is the place where we need to build our altar and refuse to be distracted by other places and things. According to Os Guiness, multi-tasking is a big problem for believers today; we are thinking about what's for lunch or the sports game in the afternoon, what we need to pick up on the way home and many other things during our times of worship - even whether we remembered to put our cell-phone on 'silent' when we came in. This is spiritual profligacy, having many altars and giving them our time and worship - which should be reserved entirely for G-d. We should always go to Him and nowhere else! Application: How good are you at staying tightly focused on G-d and not getting distracted? Perhaps it's time to ask Him how you can make Him your altar and rest in His presence each day.